Welcome to a unique and friendly hostel, built by travelers for travelers. VOTED BEST HOSTEL IN COLOMBIA, the Dreamer is the CLOSEST hostel to TAYRONA PARK and Minca making us an excellent base for discovering the natural beauty of the Sierra Nevadas while also providing easy access to the city sights and fun nightlife of downtown Santa Marta. 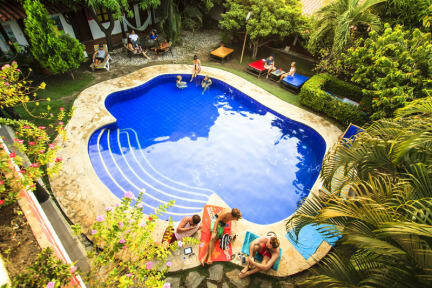 Different than the closed and claustrophobic hostels typical of downtown, our large garden swimming pool and hammocks creates an ideal resting spot for backpackers and travelers to unwind before or after their adventures. The tour desk can offer tips on getting around the area and arrange tours to the mountains, the main beaches, and to the Lost City, as well as diving activities and horseback riding. Named after different countries, we offer a wide range of accommodation from comfortable and spacious dorms to twin and double rooms in suite (air con available) warmly, decorated with hand-painted murals, with both private bathrooms and shared facility options. Come grab a tropical drink a The Coelhos Bar while you shoot pool or play ping pong with friends. Wake up to a buffet breakfast and join us for lunch or dinner at our onsite Italian restaurant offering home-made pizzas, pastas and international cuisine. For those who like to make their own food, we have a fully equipped kitchen open all day, and are located just 3 blocks from Buenavista shopping center - the largest in town featuring cinemas, supermarkets and shops. Amenities include two dining areas, BBQ and an awesome TV lounge with Cable TV and XBox; Check in is open 24 hours with complimentary bag lockers. We also offer complimentary Spanish lesson...and Internet is free!! If you are looking for a unique Santa Marta experience, we welcome you to come join our Dreamer family! Great place, outgoing people and excellent location for hikes around Santa Marta. Recommended! I had a really awesome time at this hostel! It has a good balance of chill vibes and fun social gatherings. The food and drinks in the bar and restaurant are super cheap. The rooms are decent and have good sized lockers. The pool is a nice asset as well! The staff here are amazing and made our stay an absolute treat, we even extended our stay by three days! Fantastic hostel with great social atmosphere, nice staff, and great trips. Definitely coming back! The reception staff is great.. especially Carolina she’s the best ❤️. I love dreamers and am definitely coming back. Best hostel in Santa Marta! They made us feel so welcome and such a good atmosphere! The staff are INCREDIBLE! We love you Carlos!!! Rooms are comfortable, nice places to relax in, and they put on really fun activities all the time! Feels like home after just one night! Couldn’t recommend more! We loved this hostel. The staff were really helpful and friendly. The food was good and cheap and the pool was a great addition! Pro - Clean hostel just on the outskirts of Santa Marta main town. Close enough to walk to the bus station (however with bags to hot, only costs 5 pesos in a taxi). Pool is decent, however could be cleaner. Bedrooms were kept clean, highly recommend a room with AC due to the temperature. Staff were really nice, friendly and accommodating. Cons - the staff do not allow you the remote for the AC, and you have to ask them to turn the AC up and down, on or off, even throughout the night.